Brooklyn is yet another part of the greater New York City area I've long neglected (oddly enough), but I finally made a visit on a recent Saturday. The conditions could not have been better, as the wind blew just enough to offset the warm rays of the sun and the streets were only mildly populated. Amidst it all, my three companions and I meandered down Flatbush on our way to fantastic fare at the Burrito Bar (great burritos!) and then on to Gorilla Coffee a few blocks over. Gorilla has long been a place on my list of spots to dock at, so when we finally arrived I was not surprised that there was a line out the door (though I thought many of these people had been before). My compatriots plopped down on their bright red benches out front and I passed into their medium-sized cafe with a busy bar (at least four Gorilla-ians scurrying about) and bright red tables full of patrons. Gorilla roasts their coffee and as somewhat of a testament to the popularity, half the people in line in front of me grabbed a bag or three of coffee with their order (I'd never seen such volume purchased in 15 minutes!). I ordered their deep roasted Brazilian via drip, a coffee that had been roasted a little too dark for me but had lots of redeeming aspects, such as some pound cake on the front, a bit of noticeable spice like that of a fine cigar and a nice acidity throughout. The espresso fared well, as the shots were pulled short and had a sugary and tart cranberry taste with some decent flecks of vanilla and a decent texture. The tea is Choice Organic Tea. Satiated, I retrieved my friends outside and we left to go to Junior's Cheesecakes (a place according to my Brookyln-born boss is unparalleled anywhere else and now, after eating their strawberry shortcake cheesecake, I would have to agree). I would say that despite my dark drip, I went pretty ape for Gorilla. 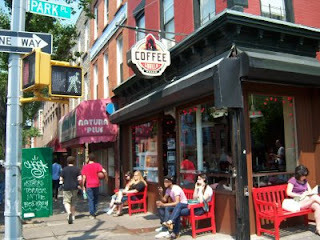 When you're in the Park Slope area of Brooklyn, drag your knuckles down to Gorilla Coffee. Great post. Nothing quite like a great coffee shop. Starbucks just doesn't cut it sometimes. I love Gorilla! I also love Gorillas, which is why I've been arrested three times. The website is a nifty yet abstract one. Go to gorillacoffee.com and click the text that says "shop."